The Biomedical Image Segmentation App (Biomedisa) is a web application for segmentation of computed tomography (CT) scans, magnetic resonance images (MRI) or any other volumetric images. Remaining one of the most challenging tasks in computer vision, image segmentation is a prerequisite for the investigation of morphological questions. Biomedisa can be used in addition to any segmentation tool like Amira, Fiji, ImageJ or MITK. The user-friendly segmentation process is hyper-parameter-free, eliminating the need for a complex and tedious configuration. The use of graphics processing units (GPUs) enables the evaluation of large image data (8 GB and more) in a short time. You can upload your image data and pre-labeled slices, run the segmentation process, and visualize the image data and results using 3D rendering software and a 2D slice viewer. Biomedisa finds its root in the projects ASTOR and NOVA financed by the Federal Ministry of Education and Research (BMBF), Germany. Biomedisa is free-of-charge. Julián Balanta-Melo et al. studied the effect of masticatory function on tooth enamel and dentin in adult mouse molars after segmentation of three separate materials (enamel, dentin, and alveolar bone). Left: 3D reconstruction with enamel (white) and dentin (yellow) without surrounding alveolar bone tissue. Their results were published in Revista Estomatología. Wasps in several-million-year-old fly pupae studied with synchrotron X-ray micro tomography and analysed with Biomedisa. 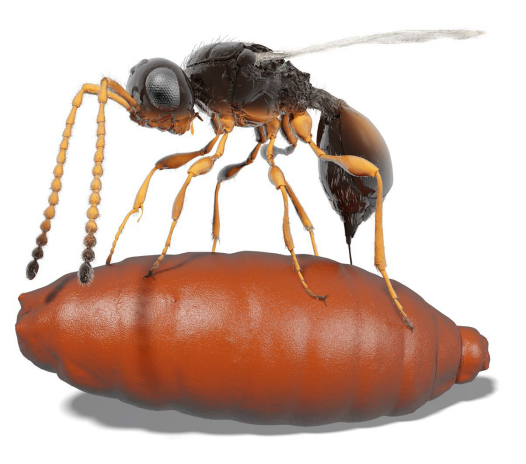 Parasitic wasps existed as early as several million years ago. Within a project coordinated by Karlsruhe Institute of Technology (KIT), researchers of various disciplines for the first time definitively discovered fossil parasites inside their hosts. The scientists studied fly pupae from old collections using ultrafast X-ray imaging. They found 55 cases of parasitation and described four extinct wasp species that were unknown until now. Their findings are reported in Nature Communications (Open Access, DOI: 10.1038/s41467-018-05654-y). The data sets with the discovered parasites are available at http://www.fossils.kit.edu and in the Demo section. Users, collaborators and scientists interested in using photon sources for their research, will meet at the annual DESY Photon Science Users’ Meeting "Research with Synchrotron Radiation and FELs" from 25 June to 26 January in Hamburg. We'll present Biomedisa within the scope of the talk "The NOVA project: maximizing beam time efficiency through synergistic analyses of SRμCT data" in the satellite workshop "Helmholtz-Zentrum Geesthacht GEMS Outstation: Materials Research and High Resolution Imaging". We are looking forward to seeing you in Hamburg. To support the workflow of Amira users, it is no longer necessary to convert Amira files to TIF format. Images and labels can be loaded directly into Biomedisa as Amira files. The result is then saved with all meta information in an Amira file and can be imported back into Amira for immediate further processing. The ICTMS 2017, from 26 June to 30 June, will bring together an international group of scientists, from universities, research organisations and industry, to discuss a broad range of issues related to the use of 3D tomographic imaging in materials and structures. We will give a talk in the analysis session. An abstract can be found here. The ISC High Performance 2017, from 19 June to 22 June, is dedicated to tackling HPC technological development and its application in scientific fields, as well as its adoption in commercial environments. It brings together researchers from academy and industry in the field of high performance computing. Biomedisa was represented together with the Computing Center of Heidelberg and the EMCL. Trigonopterus weevil processed with Biomedisa. Tomographic scans were performed at the imaging beamline of the Institute for Photon Science and Synchrotron Radiation (IPS) at Karlsruhe Institute of Technology. Segmentation and video were made by Thomas van de Kamp. Our interactive 3D visualization tool is developed by our ASTOR and NOVA partners from the Institute for Process control system and electronics (IPE) at Karlsruhe Institute of Technology. You can use the demo session for testing the tool. It is well tested with Chrome Browser, but you probably need an adequate GPU for fluent visualization. Segmenting the blood pool and myocardium from a 3D cardiovascular magnetic resonance image allows to create a patient-specific heart model for surgical planning in children with complex congenital heart disease. By using Biomedisa we achieved a high segmentation accuracy combined with a small amount of manual labeling and a short computing time. Instead of the use of static images or movies, complex morphological 3D models based on segmented datasets have been published in the last years as 3D PDF files. 3D PDF files allow the user to handle and examine relevant structures interactively. As an example, you can download a 3D model of Euphthiracarus reticulatus by Sebastian Schmelzle here and open it with Adobe Reader. If you want to find out more, download more examples or even read about animated 3D PDF files, we strongly recommend you to read "Three-Dimensional Reconstructions Come to Life – Interactive 3D PDF Animations in Functional Morphology" by Thomas van de Kamp et al. On 8 December 2016 the 12th Modellierungstag Rhein-Neckar will focus on data visualization. The event aims to enable an exchange between scientists, developers, theorists, and industry. We will present Biomedisa and its recent developments. MICCAI 2016, the 19th International Conference on Medical Image Computing and Computer Assisted Intervention, was held from 17 October to 21 October in Athens, Greece. The annual MICCAI conference attracts world leading biomedical scientists, engineers, and clinicians from a wide range of disciplines associated with medical imaging and computer assisted intervention. The biomedical image segmentation app was presented in a workshop being held along with the conference. From 13 October to 16 October the 9th Graduiertentreffen der DZG (Deutsche Zoologische Gesellschaft e.V.) Fachgruppe Morphologie took place at KIT, Karlsruhe. Presentations were given about classical, modern, and future-oriented morphological image processing techniques. We presented our application and came into contact with many users and developers of morphological analysis tools. On 13 September we also gave a talk at the DZG Workshop "Engineering tools in morphology – automated image processing, rapid prototyping and determination of material properties" in Kiel, Germany. From 27 February to 3 March 2016 the SPIE Medical Imaging Conference 2016 took place in San Diego, California, USA. More than 1,000 presentations were given on the latest research in the area of medical imaging covering various topics such as Physics of Medical Imaging, Image Processing, Computer-Aided Diagnosis as well as Image-Guided Procedures, Robotic Interventions, and Modeling. Biomedisa presented its diffusion algorithm based on their research „Enhancing a Diffusion Algorithm for 4D Image Segmentation Using Local Information" within the BMBF Project ASTOR.